Eduard's musical interests span a variety of musical genres, including, classical, world, ambient, electronica, and rock and blues. His venture "SchwanSongs" is where he writes and publishes his own musical compositions, usually classically-based music of sweet longing and hope... music meant to transcend language and cultural differences and stir the soul of the listener. His musical influences come from a lifetime of classical, 60s-80s rock, electronica, and world/folk music from many countries (South America, Russia, Japan, Ireland, ...) A few influential names are: Pink Floyd, Tangerine Dream, Loreena McKennitt, Yamasaki Hako, Tears for Fears, Enigma, J.S. Bach, Beethoven, Haydn, Tchaikovsky, Berlioz, Sibelius, Stravinsky. If you wish to venture away from the traditional, and head toward my more experimental synthesizer works, please check out my "ic42" pieces here. Also, you may be interested in a little blog about my two ways of writing music. In September 2009, I ran the exciting Macjams SpaceRace Challenge. Please check out the amazing "Space" music that so many Macjammers created there! The very talented, very warm-hearted Mark Holbrook here offered to interview me, and I give a great deal more biographical background than anyone could wade through... click here to read some of my tangential history. 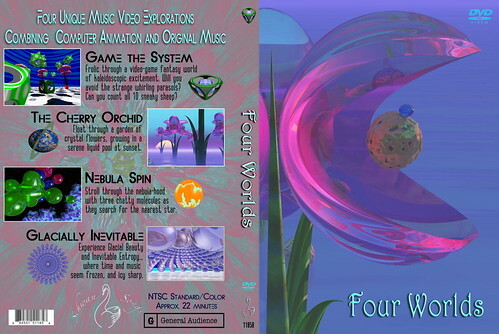 "Four Worlds", a surreal animated musical journey through 4 different worlds... running over 22 minutes, this NTSC-formatted DVD will stimulate your imagination. I wrote the music, created the computer animation, designed the DVD case artwork and DVD itself, and now it is time for you to enjoy it! I would be delighted if you stopped by the web page here, where you can read more, and purchase your own copy of this DVD if you like. Here's a video I shot while on vacation in Big Sur, California, where we got up-close and personal with at least 15 amazing California Condors! Dulce Amor - RoxyVox, [Roxylee]: Roxylee took a little dulcimer strum I recorded, and added wonderful lyrics and singing, transforming it into a real song. Drak's Bear Rag-LIVE!, [leemiguel2004]: I am not sure how, but the amazing Lee Axford was able to actually PLAY my "Lickety Split" rag live! Nobody told him that since I didn't play piano, I accidentally scored it so it could only be played with 11-fingers. My Ring (MJRF), [MyFakeIdentity]: My little piece called Maru, here was masterfully re-crafted and rewritten into 5/4 time! Temporal Tantrum final mix [w/ Drakonis and Sister Savage], [TonesTones], [Sister Savage]: The dark broody instrumental got a ProGothic makeover when Steve and Tess got ahold of it! particledots v/s ic42 (8 chords), [particledots]: A very wild experiment, created by extracting 8 random chords from 8 random songs of his and mine, then weaving them into a piece of music. Andes Off by Drakonis w/ maure & awigze, [Maure],[AWigze]: My "Andes Off" piece takes flight, with real live turtle-shell percussion played by Andy, and the guitar part played by his wife Maureen. Dark Dreams by StrangeDream, [StrangeDream]: This is my Childhood Dreams instrumental, beautifully darkened with lyrics sung by Natalie aka StrangeDream. Am I Being Unfair?, [Daphna], [CJorgensen]: Run the text of this MacJams forum thread through my mythical 'i-Sing' auto-lyrics-generator program, add Daphna's awesome talent for catchy tunage and bouncy vocals, and out pops this! It's probably best to read the first page of that forum's posts first, then listen to the song, it'll make more (or less) sense. SlimGirlThat, [MacJammersUnited]: I wish Slimmie a fantastic birthday around the 1/3rd mark. Happy Birthday, Drakonis!, [roxylee and others]: OK, not a collaboration with me, but a collaboration FOR me... this was Roxylee's surprise birthday song for me... she asked a BUNCH of other Macjammers to help with this unforgettably sweet birthday present... thank you Roxylee and everybody! Ember-Rekindled, [Drakonis]: This is my original ambient piece. Ember-Zitified, [Ziti]: Ziti's beautifully relaxing "Jeff Beckian" guitar caressing the flames. Ember (Haunting Alannah Remix), [Alannah]: Alannah turns Ember into a hauntingly somber poem, with ethereal wispy singing. Ember-Ablaze, [Avoider]: Ember is "IDM"-ified with Av01der heating up the drums. He also liked the ending I had faded out, so he revived and extended that a bit. Ember (TaylorMorgan Remix), [taylormorgan? ]: Ember gets a new set of dreamy voices and some tasty drums. The Legend of Drakonis, [comdotdom]: The hilariously talented Dominic weaves a partly mythical (but definitely whimsical) origin of "Drakonis". Tongues on Ember, [RSchletty] ** GONE? **: This is my Ember-Rekindled backdrop music, with Richard taking us on an amazingly creepy/humorous/twisted journey into a demented mind! Probably one of the most ingenious directions anyone has taken Ember so far. Best played on Halloween or in an old folks home. Ember in Transition, [RSchletty] ** GONE? **: This is my Ember-Rekindled backdrop music, with Richard waxing philosophic about the transition state between dreaming and waking. Ember imbued by Amboo, [amboo]: Amboo sings her own lyrics over Ember. Ember and Cherry Blossom, [Mystified]: Mystified swirls a Japanese breath of cherry blossom harmony throughout, and reads an ancient poem of mine. Ember Poem - Caroline's Reading, [Caroline]: Caroline reads my corresponding poem "Ember", which gives a glimpse of my original thoughts when writing the music. Ember, [EccentrikAmerika]: This is my "Ember-Rekindled" music, Retro-Spacey-Electro-fied". DidgeEmber (with Didge-Ache), [Didge-Ache]: Primal and hauntingly trance-inducing drone of the didgeridu, played by Didge-Ache, woven in by Drakonis. Ember (Estate Mix), [ElectroEstate] [Didge-Ache] ** GONE? **: This is my "DidgeEmber (Didgeridu mix)" music, with Didge-Ache on Didgeridu, and ElectroEstate-swirled Trip-Hoppyness". Ember (EZamor Mix), [EZamor]: Ember goes on a darker twistier journey with EZamor at the helm. Yev-Ember, [Roxylee]: Roxylee captivatingly reads a dark Russian Poem (in English). Electrified Ember, [Electric Lobster]: The Electric Lobster gives Ember a major thumping, sending it spinning off in his dizzyingly delightful directions... intriguing harmony, rhythm, and sound abound. Cinder, [Obstructions]: The last atoms of Ember speed toward their final quantum decay, with some of Obstructions' signature gritty deconstructive surgery. Ember (Kigas Mix), [Justbase] ** GONE? **: Intriguing twisty blippy schizophrenic paths lead to this Ember. I rem Ember it well, [SteveWhit]: Ember becomes the deliciously nightmarish backdrop for an Alfred Hitchcock film. Em2ber, [Michael2]: Deep space planets send indecipherable signals, lost in the cosmos. Surfing Embers (Woodguy Remix), [Woodguy32]: Ember gets a Totally Tubular Make-over with Woodguy's awesome surf-guitar parts and little Brassy bits added (Hawaii-5-Ember?). Ember (Woodguy Sunset Surf Remix), [Woodguy32]: Woodguy32 has returned to give Ember another surf-guitar wax polish, this time he wanted to a more true-to-original treatment. Ember (Salamander Mix), [Lizard*Whistle]: Ember floats back to the isles of Aulde, where Lizard*Whistle plays guitar, lizard-whistle, and sings of moonlit nights on the moor. Smokey's Embers, [SmokeyVW]: Ember goes Classically Greek, and gets a stately symphonic treatment. Another Green Ember, [Bud]: Bud's edgy synths and drums give an exotic steamy feel to Ember. RemEmber 1947, [Skean]: A weary soldier, drawn home by the one he loves. TranceNation, [Skean]: Spacey Trippy Trancey Sparkly Ember. Hiroshima Remembrance 2002, [rschletty/Skean] ** GONE? **: Richard reads a stirring speech by the mayors of Hiroshima & Nagasaki. Ember-Descent (ic42 Depression Mix), [ic42]: A slow, mysterious descent to the bottom of the ocean, and back? Ember (Lupiroz Mix), [lupiroz]: Ember goes to Sunday morning Electronic Mass. Ember (Feat. Morning Light Vox), [Morning Light]: Morning Light sings a gentle improv over Ember. Ember (Kassia-fied), [Kassia]: Kassia takes Ember on a New (age) direction with her soft touching piano work. Tumbleweed Ember, [RichardHowardJones]: Ember hits the desert trail, riding off into a beautiful sunset. Marching Forward to Emberland, [Diviner]: Ember gets a 21st century ElectroIndustrialDarkwave outfit, and struts out in a bold new direction. Luna Ember 29 w/Drakonis, [LunaTrick] ** GONE? **: Ember gets caressed by Daniel's Cello work, so deeply involved in playing this that a string snaps partway through and he plays on, even more soulfully. Still She Weeps (Ember Char Mix), [Char]: Ember goes orchestral to support Char's wonderfully sung poetry. Yember (Yeman Ember Mix), [Yeman]: Yeman adds a beautiful dichotomy to Ember with his split-personality (electric slide/acoustic) guitar work. Ember (Dadgarus Mix), [Dadgarus]: Ember slides over to Persia to dance to Dadgarus' guitar... he whipped this up in a blazing 6 hour session! Ember-A Heart of Stone Turns to Flesh, [awigze]: Dreamy sax accompanies beautifully sung scripture. Ember Remembered - Drakonis Open Collab, [Boundless]: Ember swings into jazz mode with great guitar work by Bernard. Carla's 1st Ember, [carlajpatterson]: Carla stirs up all sorts of genres with her singing over ember. Carla's 2nd Ember, [carlajpatterson]: Carla cries conflicted tears on her second Ember song. Ember-A Heart of Stone Turns to Flesh (Sax-Instrumental), [awigze]: Andy's dreamy sax and harmonica propel us across the River Ember in this gentle interpretation. I.G.Mber, [IGM]: Ingo Paints a romantic sunset in strings. Sweet Embers Of Love, [AngelaHope] ** GONE? **: Angie sings so sweetly of wishing for love in the moonlight. Embers of Velvet, [Velvet_Audio_Lab]: Ember paints pictures of a warm Thai sunset sparkling in the waters of the bay. TRIBAL EMBER By Chiefalannahrunswithscissorsfeather, [Alannah]: Get lost in the rain forests of the world with this immersive EthnoEmber, she even has Tuvan Throat Singers and didgeridus. The Evolution of Ember (An Ember Rekindled Mix), [Reinholdt56]: A little electronic kerosene makes Ember suddenly glow white hot. NovaEmber or, Ember's Glow, [Richard13]: Intriguing sultry rhythms to chill out to. Ember-Symphonic Flow, [Chimalus]: A deftly, gently orchestrated Ember. Ember (Red to grey), [Perry Mental]: Ember starts off going to primary school, but gets on the wrong bus for a terminally twisted psychological ride. Ember (Far Eastern Seaboard Mix), [VicDiesel]: Ember goes east, and gets the Dizzy ostinato Glassy Gamelan treatment. Ex Umbra In Solem, [SmokeyVW]: Ember gets soaked while traveling under a dark thunderstorm, and radiates a smile when the sun and birds brighten the ending. Music Background As a teenager, he built his own electronic and software synthesizers and sound filters, learned to play clarinet, and was sound engineer for a short-lived high school rock & roll band. In college, his interest in computers and synthesizers led him to writing his own music... one note at a time. He stopped writing for a decade while raising his children, but has now returned with a passion. Today, he has a Macintosh-based studio in his den, and has written a number of short pieces of music, from classical, ragtime, and ambient electronica genres. A couple of his pieces have been broadcast on KSVY FM radio in Sonoma, California, and he has collaborated on his music with other musicians around the world via the internet. He has also produced a short computer animated music video, and is working on a second one. Music is hardly his only interest. By profession he is a software engineer, and has written factory automation software, educational software for elementary schools, game software, natural language translation software, and is currently writing income tax software. He has run a home-based Macintosh shareware company for many years, and created the popular Quicktime movie utility "MooVer" which took the coveted 5-mice rating in MacUser magazine. He also wrote and published a 3D computer graphics book called "Ray Tracing for the Mac/CD", and is co-inventor on a couple of patents. Although he's lived in California all his life, he likes traveling, and has been to Japan, Canada, Bavaria, Austria, the UK (and stood within the circle at Stonehenge), France, the Yucatan, and even went to Detroit once. He also loves photography, filming educational/travel movies, drawing, being married and being a dad. Music Skills excrutiatingly slow note-by-note composition. Music Hardware Focusrite Saffire audio interface, AKG Perception 200 mic, cheap radio shack MIDI keyboard. Music Software Myriad Harmony Assistant (for writing music), GoldBase 1 (sampled GM instrument library), GarageBand 4 & Jampack 4 (and Amadeus) for recording/mixing.